Labor pain can be a tiresome and lengthy experience. It's not easy to watch someone endure pain, especially the woman you love. 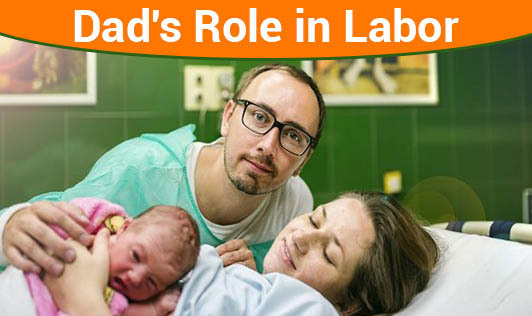 You may think you do not have a role during the labor process, however, being a supportive husband can reduce the amount of stress on your wife and make the situation of labor pain more bearable. Here are simple tips which you can keep in mind during the later stages of your partner's pregnancy. • At this point, you need to be encouraging and supportive. • Make sure you know all about the hospital where she plans to deliver. • Also know the shortest route to reach the hospital during the onset of labor. • Be calm and take a walk around the hospital. Don't do this during the end stages of labor and also make sure you don't leave your wife alone for too long. • You should be your partner's most important support, though there will be a number of experienced people around you to give you the help you need. • Just holding her hands and keeping eye contact with her can be hugely comforting. • A gentle rub on her feet can be of great comfort during early labor. • Make sure that you are present throughout labor, birth, and in the hours and days after your baby is born. • Most hospitals have all specialties and comforts, but some have restrictions about who can be present during a c-section or at other times. Be informed about it. • Ask whether you are allowed to cut the cord of your baby. • Childbirth classes or antenatal programmes are of great help. It will make you feel more confident to deal with labor and childbirth. This will help your partner ease through the experience. All the best!!! Above all, be sensitive to your partner's needs. It Matters!! !